By the time he’d rustled up a delicious-looking plate of prawns bathed in a wine-rich tomato sauce, my mouth was watering. Prawns alla busara are a ‘roll up your sleeves, and paper towels at the ready’ kind of dish. 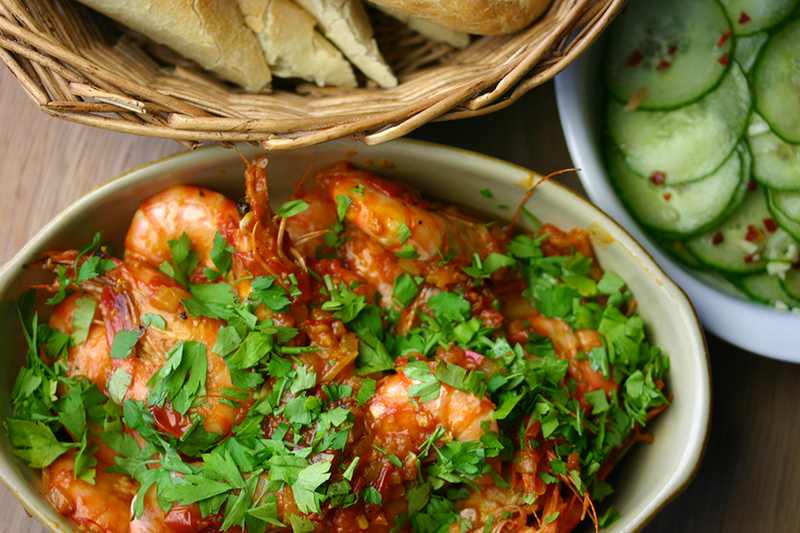 I guarantee you won’t want to leave any of the sauce, so serve these prawns with crusty bread to wipe the plates clean. The number of people it serves depends on the size of the prawns, and whether it’s a starter, the main event, or part of a tapas-style meal. Heat two tablespoons of oil in a frying pan over medium heat. Sauté the shallots and garlic until softened. Add the tomato paste, tomatoes, chilli flakes and saffron and cook a couple of minutes more. Add the wine and water, bring to boil, then reduce the heat and leave the sauce to simmer for about twenty minutes. Heat the remaining tablespoon of oil in a separate frying pan. Cook the prawns for a couple of minutes (until just pink), then add to the sauce, tossing to coat. Season generously with freshly ground black pepper. Stir in the bread crumbs, cook a couple of minutes more, then turn off the heat. Drizzle the prawns with olive oil and scatter with fresh parsley. Serve with crusty bread. Will be sure to try this one as I just got prawns from our local fisherman. Any hints on how to handle the obvious mess? Wear dark clothes…;-) and lots of paper towels!